The evening of comedy will raise funds for national charity SeeAbility and features Adam Hills, host of Channel 4’s The Last Leg and Live at the Apollo regular, Seann Walsh. 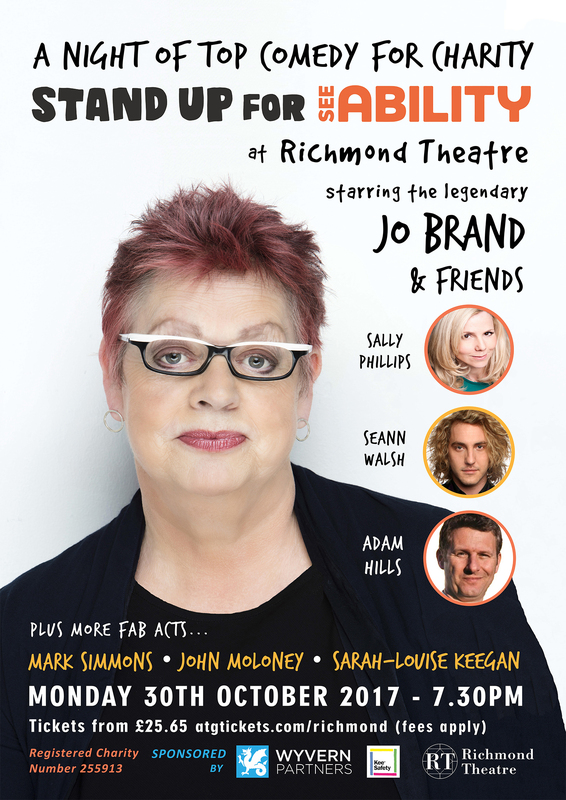 Richmond Theatre will host ‘Stand Up for SeeAbility’ on Monday 30th October, where Jo Brand will also be joined by Sally Phillips from Bridget Jones’s Diary and award-winner Mark Simmons, as well as Sarah Louise Keegan and John Moloney. It will all be introduced by former Paralympian, Lord Chris Holmes of Richmond MBE. “We’re thrilled to have such prestigious acts supporting our cause and helping us raise awareness about the work we do at SeeAbility through an evening of comedy”, says Lisa Hopkins, SeeAbility’s Chief Executive. SeeAbility is a 200-year-old charity with strong local roots to Richmond. They provide extraordinary support for people with learning disabilities and autism across Surrey and the South of England, and champion eye care for adults and children with learning disabilities. The event is sponsored by financial advisory firm Wyvern Partners and Kee Safety Group Ltd, who provide industrial safety equipment. “Both companies are delighted to have been able to play a part in making ‘Stand Up for SeeAbility’ possible. We look forward to a laughter-filled evening which also supports a charity close to our hearts,” says Mike Barnes, one of Wyvern’s managing partners.